The amendment former President Mahinda Rajapaksa brought to remove former President Chandrika Bandaranaike Kumaratunga from the Chairmanship of the Sri Lanka Freedom Party (SLFP) has resulted in himself being removed. 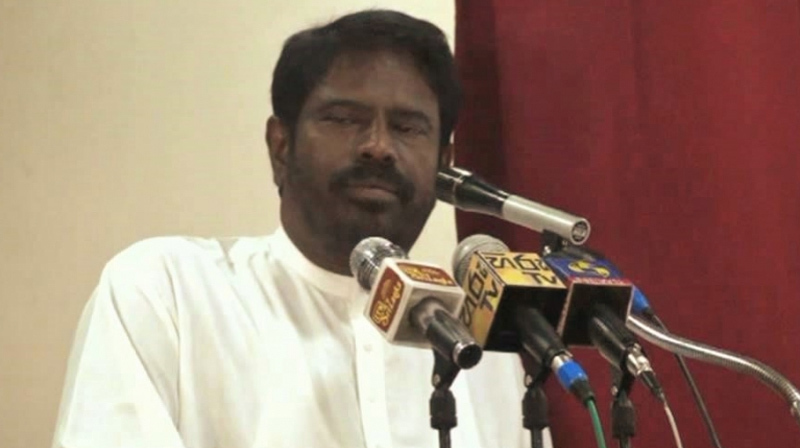 He now pretends to have forgotten all of this,Irrigation and Water Resource Management Management Minister Gamini Vijith Vijayamuni Soysa said. The Minister stressed that no matter the opinion, it was President Maithripala Sirisena who is the chairman of the Sri Lanka Freedom Party. He mentioned this at a special media briefing at the Department of Irrigation yesterday (22). “I too functioned as a Cabinet Minister in the Rajapaksa government. But, we also witnessed the former President handing over power to Prime Minister Ranil Wickremesinghe in the early hours of January 9 and exiting Temple Trees,” Minister Vijayamuni Soysa. He said, I have lost and I bow my head to the peoples’ mandate. Basil Rajapaksa left for America soon after, explained Soysa. “According to Section 12 (2) of the Party Constitution, the Chairmanship of the party goes to President Sirisena without contest. This section was amended by former President Rajapaksa so that he can remove former President Kumaratunga from the post of Chairman. At the time, I too raised my hand in favour of the amendment. According to this section, a member of the party, when elected as President automatically inherits the post of Chairman of the party,” he said. Minister Soysa added further that Mahinda Rajapaksa was now speaking in a manner in which he has forgotten all this. “When President Sirisena took office and many party supporters went to his side, along with the central committee, Rajapaksa called President Maithripala Sirisena to the then Speakers’ house and handed over the Chairmanship over to him without anyone being consulted,”the Minister added. “Thereafter, the incumbent President as a show of respect to all party seniors, amended Section 12 (1) of the Constitution. Accordingly, any member who has held the office of President or Prime Minister would be made a Patron of the party and it also allows the Party Chairman to appoint any senior member to the position of Patron. Thus former President Rajapaksa accepted the post of patron,” he explained. “Now we need to see why he is talking about the chairmanship. He wants to promote his ‘Podujana Peramuna’. This indicates signs of memory loss or perhaps he is forgetting this on purpose. Either way he does not seem to be aware of the difference between Chairman and Patron of the party”,the minister.